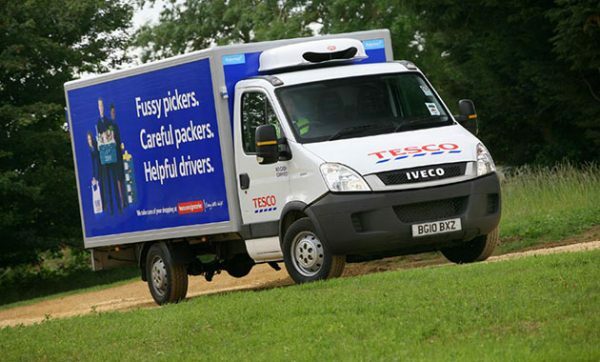 Tesco Distribution has rolled out an additional 15 Paragon systems to provide complete control of its vehicle routing and scheduling needs. A total of 26 systems are now used for the daily planning of 4,000 drops, made by 1,400 vehicles to over 700 stores throughout the UK and Ireland. Tesco’s decision to implement the software across its entire food distribution operation reflects satisfaction with previous implementations, including its high-profile and highly successful internet-based home shopping service. Interfaced with Tesco’s order processing system, Paragon helps Tesco meet its tight store replenishment timescales by completing the vehicle routing and scheduling process in several waves throughout the afternoon and evening. Unable to wait for a full day of orders to be received, Paragon gets ahead with the scheduling task by processing its first set of orders at around 3pm each day. Priority loads can then be ‘frozen’ and released to the pickers and loaders to ensure that despatch deadlines are met. Other loads are carried forward and merged with subsequent order downloads received. This enables orders from different waves to be amalgamated into the overall distribution plan to maintain efficiency, whilst priority store deliveries are routed, picked and despatched even before the final orders for the day have been received. In addition to calculating vehicle loads and maintaining an even distribution workload throughout the day, the Paragon system also takes constraints associated with different product ranges into consideration. Some chilled produce, for example, must arrive at specific times, typically the beginning of the day – something that Paragon can build into the overall transport plan. Once scheduled, details of the routes, including planned store arrival times, are passed to an in-cab fleet management system for real-time monitoring. Tesco Distribution is also using Paragon vehicle routing and scheduling to create scheduling ‘routines’, a series of best practice guidelines now embedded into the everyday life of each depot. Not only do the guidelines encourage the same high quality operational service across the whole of Tesco’s business, they also promote the development of common skills at all sites. Overall, Tesco Distribution’s choice of Paragon for all its temperature-controlled and ambient distribution centres in the UK and Ireland reflects satisfaction with existing systems. It also indicates a determination to ensure consistency throughout the network covering 1,400 vehicles delivering to Tesco’s 700+ stores. “The quality and reliability of the Paragon system made it the obvious choice for Tesco Distribution”, says Ken Davis, Transport Development Manager. “This combined with the ease of implementation and the high level of support made available, has enabled us to install Paragon’s vehicle routing and scheduling systems effectively within all of our 26 distribution centres. This ensures that we maintain a high standard of service throughout the operation. Paragon is a key operational system which we rely on every day”.